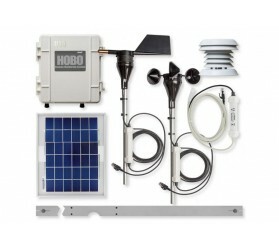 The HOBO Weather Station Starter Kit combines our most rugged data logging weather station with out-of-the-box convenience.The U30/NRC accepts up to 10 plug-and-play Smart Sensors. Just plug in your sensor and it’s automatically recognized – no programming, wiring or calibration necessary. With this kit you can measure temperature, relative humidity, wind speed/direction. Simply select the HOBO Weather Station starter system and your choice of either a 2-Meter or 3-Meter Tripod Kit and go!Software ordered separately. Compatible with HOBOware and HOBOware Pro software for logger setup, graphing and analysis.